Pressure is being applied by activists after a group of BBC journalists was arrested for trying to report on labor conditions in the country. 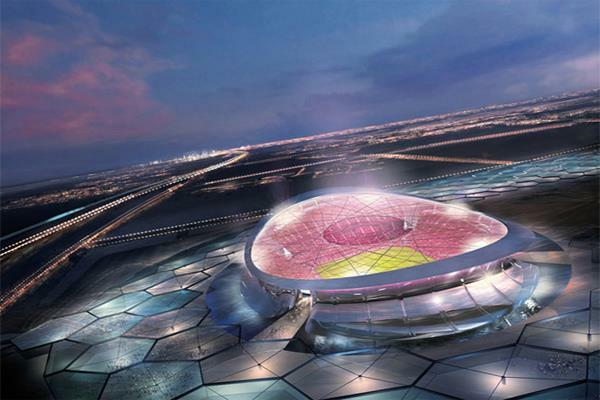 The planned Lusail Iconic Stadium in Qatar. (Image via WhyQatar2022.com). ZURICH: Activist groups are pressuring FIFA’s sponsors to speak out on working conditions in Qatar, equating conditions at 2022 World Cup sites to "slavery." They are calling on Coca-Cola, Adidas, Visa, Kia, Hyundai, McDonald's, Gazprom, and Budweiser to challenge alleged human-rights abuses at the construction sites. Activists from the International Trade Union Confederation, the Trade Union Congress, Skins sportswear, and the New FIFA Now group slammed the working conditions and said brands had a "responsibility" to help workers. Hundreds of workers have reportedly died in desperate conditions where temperatures can hit 122 degrees Fahrenheit. "Everyone who is part of FIFA’s family, as the sponsors are, has a responsibility about what is going on in Qatar, about the abysmal conditions, and numerous deaths, of migrant workers," said British MP Damian Collins, part of New FIFA Now. "If they do not speak out about the appalling conditions, then their reputations will be tarnished around the world." Jaimie Fuller, chairman of Skins, the sportswear brand dubbed the "official non-sponsor of FIFA," has drafted a letter to each sponsor's CEO, asking them to push for reforms on FIFA’s "way of doing business." While sponsors have spoken out against FIFA before, none seem to be prepared to take the more draconian approach of pulling out of their deals. Fuller said sponsors have the chance to change the situation, pointing to the precedent set by Olympic sponsors during the Salt Lake City corruption scandal before the 2002 Winter Olympic Games. "So far, FIFA’s sponsors have restricted themselves to a series of rhetorical statements aimed at defending an indefensible association," he said. Portland Communications handles PR for the Qatari Government. It declined to comment.